GiftAMeal CEO Andrew Glantz and Operation Food Search manager Mark Taylor check contents of bags with ingredients for chili that will be sent home with school children for a weekend meal through a program sponsored by the food bank. As many families prepare for the annual Thanksgiving feast, not everyone has the opportunity to sit down to a traditional meal on Thursday, or any other day of the week. The statistics about food insecurity — hunger — in our region are stark. “Missouri is one of the hungriest states in the country,” said Mark Taylor at Operation Food Search, a food bank that distributes 200,000 meals a month in St. Louis and 31 surrounding counties in Missouri and Illinois. In the greater St. Louis region, one of every six individuals lives in poverty and struggles with hunger. That includes more than 125,000 children. The definition of food insecurity is not knowing where your next meal is going to come from. A St. Louis startup is dedicated to providing meals to the hungry. And it’s doing it in an innovative way by tapping into popular social media trends as well as consumer support for socially conscious businesses. CEO Andrew Glantz, 23, created GiftAMeal during his sophomore year at Washington University. The company uses a mobile app that allows restaurant customers to post photos of their food on social media. In exchange, the company makes a donation to pay for a meal through Operation Food Search. Glantz was inspired by the ALS Ice Bucket Challenge, a fundraising campaign that went viral on social media in 2014 and solicited millions of dollars in donations for the ALS Foundation. But it was just a blip on the screen for the short attention span of social media. Glantz thought there must be a way to harness the power of photo sharing for a good cause and make it last longer than a few weeks. He and a fellow summer intern at a venture capital fund devised a business plan that would harness the power of social media, provide marketing for restaurants and create a sustainable pipeline of donations to food banks. Glantz said once he had quantitative data to prove that the GiftAMeal app could provide value to restaurants by attracting customers, and that app users would engage and repeatedly post photos, investors started to take notice. GiftAMeal started winning entrepreneurship competitions nationally. Locally, It received seed funding and support from the St. Louis accelerator Capital Innovators in 2016. Last month, Glantz won two of the top prizes at the Startup Connection and announced a second round of funding from private investors. This month, GiftAMeal was named one of 20 startups to win a prestigious $50,000 Arch Grants award. Splash back to the sounds of the ALS Ice Bucket Challenge and how it inspired Andrew Glantz to leverage the social media photo trend to market restaurants and feed the hungry. Smartphone users can find restaurants that support the GiftAMeal donation program on the app. One meal is donated for every food photo posted on the app and an additional meal is donated if users post on their personal social media accounts. GiftAMeal earns revenue by charging restaurants a fee to be featured on the mobile app. In return, the app promotes the restaurants to its users. Also, users can see how their photo generated a donation. The app has 19,000 users and more than 125 restaurants participating, so far. The majority of the restaurants are in St. Louis with a handful in Detroit and Chicago as the company begins to expand. 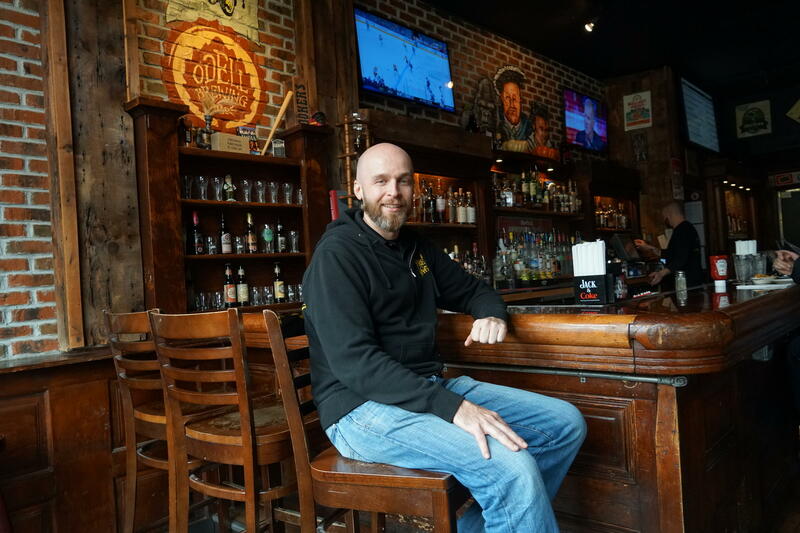 One of those restaurants is Three Kings, a pub-style bar in the Delmar Loop with three other locations in the region, including St. Louis Lambert International Airport. Three Kings' owner Ryan Pinkston was one of the first restauranteurs to partner with the GiftAMeal app. Pinkston said he donates to many community groups throughout the year, but he likes the idea of using technology to reach new customers and do good at the same time. Customers at Three Kings post an average of 400 photos monthly. For every food photo posted on the app, GiftAMeal donates 11 cents — enough money to pay for one meal or 1.2 pounds of food — to Operation Food Search. To date, GiftAMeal has funded more than 184,000 meals. Glantz emphasized that his company’s app is not a substitute for charitable giving, “It’s a complement,” he said. He hopes it raises awareness about food insecurity by connecting customers and restaurants that share similar values. “The core concept of GiftAMeal isn’t about the photo of the food ... it’s about the customer engaging in a positive experience in the restaurant. So, with something as easy as clicking a button, you’re able to make a difference in your community,” he said. With GiftAMeal already expanding into Chicago and Detroit, Glantz's goal is to partner with restaurants and food banks — coast to coast — and end hunger, one photo at a time. Arch Grants is only 6 years old, but to date it has awarded more than $6 million in cash grants that have helped launch more than 100 companies. Arch Grants is a non-profit organization that attracts and supports startup companies to St. Louis with its Global Startup Competition. The group released its annual report Tuesday, full of testimonials from startup founders, graphs and lots of numbers. This article first appeared in the St. Louis Beacon, Nov. 9, 2008 - For would-be entrepreneurs who think they might want to establish their business in St. Louis, Jerry Schlichter's new organization might be able to provide up to 50,000 reasons to lure them here. The attorney who has worked for a long time in economic development and historic preservation downtown is spearheading a new program known as Arch Grants, designed to offer incentives to budding business executives. It would make available to up to 30 potential startups as much as $50,000 as well as assistance such as mentors, access to investors and discounted services. The new executive director of an initiative designed to attract startups to the St. Louis area brings a mix of national and local experiences to the position. Emily Lohse-Busch recently took the helm of Arch Grants after serving as a senior director with Global Impact, a Washington, D.C.-based organization that supports international nonprofit groups. She also worked for a consulting firm in Chicago, specializing in dealing with the nonprofit sector.